The music of the Second World War wasn't just about march music; a whole range of songs from sad ballads to silly songs and patriotic hymns graced the musical repetoire of all sides of the conflict. 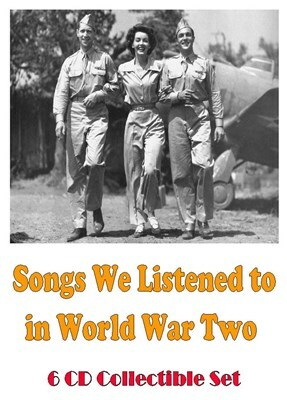 This 6 CD set is meant to give you an idea of what a soldier at the front or a civilian behind the lines heard on the radio, listened to in the films of the day or sang before the battle while awaiting his/her fate. Far from the propaganda music heard on other CDs, our production is meant to introduce you to songs you've probably never heard before (or bring back to memory ones you hardly ever hear). We've concentrated especially on Soviet and French music of the period, because American and English music from the times are easy to find and our other CDs have more than enough German music from the era. Sit back and enjoy these selections painstakingly put together. You might be surprised at how wonderful these pieces are that you otherwise would never have thought to listen to. Where are You, My Companion? Warum soll ich treu sein?